A traffic check could prevent a collision and potentially save your life (and maybe a few other folks too). A traffic check is when a driver scans for traffic and/or pedestrians at different times or locations while driving. This constant scan will allow the driver to see and react to potential hazards and avoid collisions. Just imagine you’re waiting at a red signal light and your light just turned green. Before stepping down on your accelerator, REMEMBER somebody else in that same intersection just had a yellow and red light. AND remember how your Mom would always try to race through the intersection to beat the yellow signal light before it turned red? And oops, there were probably a few times the light changed to red and you had to stare at it as you were going through the intersection in shame. Well, your Mom isn’t the only one that tries to beat the yellow light before it turns red, a lot of people do that. Watch out for them. Entering an Intersection – Traffic check As you enter an intersection, focus your attention on cross traffic. Scan with your eyes, but at some larger intersections, you may need to turn your head. If going straight through the intersection, first scan left then scan right. Look for hazards that may be entering the intersection or already in the intersection. This traffic check is also performed at the intersection when making right or left turns. Mirrors and Over-Your-Shoulder – When changing lanes, check blind spots by using mirrors and performing over the shoulder traffic checks. Before driving, adjust all rear view mirrors and look over both shoulders to ensure a clear view of blind spots before starting the engine. Use the acronym S.M.O.G to help remember the steps (in correct order) for lane change. S – signal in the direction which you want to change lanes. M – mirrors. Check for traffic using two mirrors; 1) rear view mirror and 2) corresponding side mirror (in the direction you are changing lanes. O – over-the-shoulder. Check over the corresponding shoulder at your blind spot. G – go when it is safe. 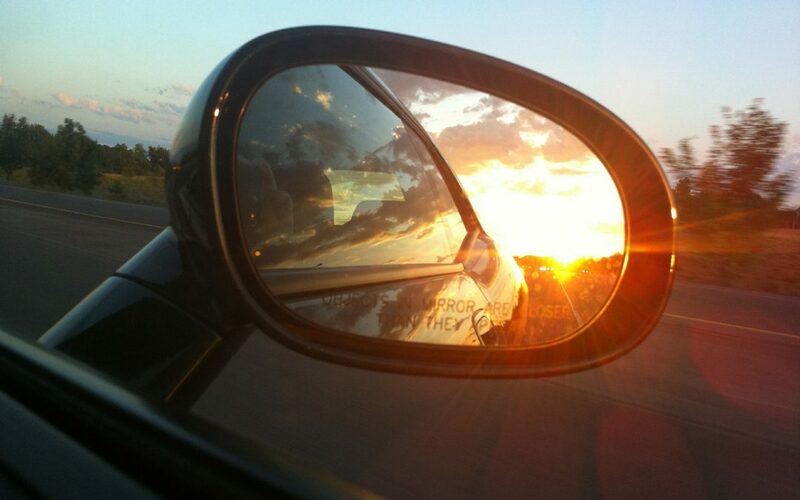 On the a Freeway – Constantly check traffic in rear view mirrors and scan at least 5-10 seconds ahead for potential hazards that may force you to reduce speeds or stop. *SAFETY TIP* Don’t drive directly beside another car while on the freeway. Try to keep a safety cushion all around you as you drive on the freeway.